DNO_Dennis, Lawrence of Berkley , and I took a drive out to Plymouth Michigan tonight looking for some good shots of the holiday lights. 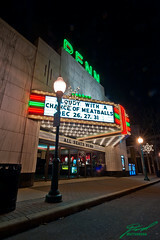 One of the subjects which calls out to be shot any night is the Penn Theatre. Tonight they were playing "Cloudy With a Chance of Meatballs."